Miracle (noun): An extraordinary and welcome event that is not explicable by natural or scientific laws and is therefore attributed to a divine agency. Something happened to me. It was only something small and very insignificant but it still made me think. I’ll tell you about it if you like. But first a brief warning. This small thing that happened to me… it… well, look, it happened on Christmas Eve but, wait, this isn’t a Christmas Post. I swear it isn’t. I know you would run a mile if you sensed this was a Christmas Post (which it’s not). That ‘Spirit of Christmas Present’ fella did his thing, got old, got a bit smelly and died and that’s enough of him for another year. So… it’s definitely not a Christmas Post. It finally happened on Christmas Eve morning that I admitted to myself that there was really only one present I wanted for Christmas. It also happened that I finally admitted to myself that there was no way I was going to get it. The present in question was very small. My needs are slight. You see, I have a very nice pair of earbud headphones for my old iPod and I use them when I’m out jogging around the lake, as I do. 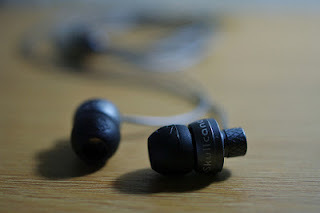 I really like them but, for some years now, I’ve been slowly working my way through the little packet of rubber earbud covers which came in the box with the headphones. Over time, the number of little rubber things had depleted until I only had two left – the two that I was using. Then I lost one of them. Suddenly the earphones were useless. Without the rubber-thing, the earbud would just tumble out of my ear. I searched in shops and online but I couldn’t find a replacement rubber-thing for my beloved earphones. So the earphones became redundant, tossed on my desk and, instead, I had to borrow my son’s traditional white iPod earbuds which are too big for my ears. It was all I really wanted – a little rubber cover thing to bring my beloved earphones back to life. I even went so far as to drop an elaborate hint to my eldest son that, if he wanted to get me a nice cheap present for Christmas, a couple of these would be welcome. I subsequently found out that my son scoured the shire for those little beauties, walking many miles to try and get his old man what he wanted. That’s nice, that is. He didn’t succeed but his attempt is better than any present. But back to this day, which just happened to be Christmas Eve. I got on a bit of a tidying kick and started removing the recycling cardboard and paper that amasses in our underused utility room sink. I brought the recycle bin up to the back door and started chucking stuff in. As I got down to the bottom, I found that there were various bits of debris littered on the stainless steel sink floor. A few copper coins, a sweet wrapper, that sort of thing. There was also something else and I know you’ve guessed this already. Yes, indeed, one of my rubber earbud covers was sitting down there, looking at me. I have to admit that I was stunned. The very thing I had wished for, an outlandishly small but still-unlikely thing, had come to pass. I cleaned up the rubber thing and fitted it to my earphone bud. It was perfect. It’s been perfect ever since. Good, eh? Good story? Cute and nice. Yes but, wait, I’m not finished. I took the earbud into the Living Room, where Trish and the guys were watching the telly and I told them what had just happened. That’s where I heard about John’s quest to get me some of the earbuds. They were impressed with my find but not nearly as stunned as I still was. Then I went back to my study (I call it a study, it’s a lot of things). Maybe I figured I should scribble something down for a possible future blog post (heh). Wait for this. There, on the floor, in front of my computer chair, was another rubber earbud thing. I literally could not believe it. I looked in my hand. The ‘sink’ one was still there. This was a second one, right there in the middle of the floor in front of me. I sat and stared at the two rubber things on my desk. For all of their smallness and insignificance, this seemed to me to be as close to a miracle as I had ever witnessed first hand. A miracle, Ken? A miracle? Let’s not get carried away with ourselves here. If people throw down crutches, if blind dudes see, if thousands get fed on a single sliced pan and a tin of sardines, that’s miracle country. A small rubber thing in your sink, even another on your floor, is not. It’s just not. I agree. Of course I do. What’s more, the only trait I think I share with Mick Hucknell is that neither of us apparently believe in many things including, I would imagine, miracles. I don’t believe in Fate, Karma, Destiny, Predestination or the Existence of the Perfect Taco. Not anymore. Sorry. Even if such things do exist, it always seems quite egotistical of people when they attribute every little loss or gain in their lives to the work of some omnipotent being turning its beady eye onto them. It feels like an all-too-convenient passing of the buck for those simple everyday benefits and vagaries of life. But this thing – this little thing - did seem like ‘something’ to me. It seemed hugely unlikely and also hugely beneficial and life affirming. I wanted to call it a miracle but I didn't believe in them so what to do? In the end it was easy. It turned out that it had been done for me already. Miracle (noun): A remarkable event or development that brings very welcome consequences. That’s it. That’s what happened to me on that Christmas Eve morning back in 2012. A miracle. It was a miracle. This doesn’t change my life or anything. I’m not putting on sandals and hitting the road. Nothing so extreme. But it’s a positive, isn’t it? It re-affirms for me that all we can ever really do is play the cards that we are dealt and that sometimes those cards will be miserly red twos and sometimes they will be the sweetest and most valuable of trump cards. It reminds me not to get too comfortable with the ups and not too uneasy about the downs. There’ll always be something different just coming down the line. Afternote: I am a pretty-meticulous ‘saver’ and ‘backer-upper’ of my work. Halfway through writing this little miracle-celebration piece, I inadvertently kicked a plug under my desk and shut my computer off. When I got back into it, every word of this piece had gone. I generally save after every line, so this kind of data loss is unheard-of. I wrote most of it again, kicked the plug again and, despite saving diligently this time, most of it was gone again. I was inclined to give up but, being pig headed, I rearranged the plug and wrote it all a third time. It’s like I was saying. I admire your perseverance on this one. 3 is a magic number they say:-) I have a mate whose unerring belief in God came after he prayed that if he really existed then he would make the Japanese golfer he was watching on tv get a hole-in-one. Next minute the golfer got his tee shot in the hole. It's a funny old world. Glad to read about your christmas miracle. I'm glad you persisted in writing this post because it strengthened my belief that there's a master planner up there who really oversees all things. It's an inspiring story worthy to be included in the book "Chicken Soup for the Soul." Thanks a lot for the ray of sunshine your story brought into my day. God bless. I am of the view in this middle age bit Ken, that the need for needless stuff is totally irrelevant. But the need for the simple things that bring us pleasure and make us happy are the most sought after and precious gifts of all. I’m like you, Ken, never had much time for people who read too much into coincidences. I knew this fellow once—couldn’t really call him a friend—who said there was no such a thing as coincidence, only godincidence. So God looking down from on high and saw you needed ear buds? Yeah, right. Pleased you found them though. I’m like you, as I get older my needs have dwindled almost as fast as my desires. A few years ago I sniffed at being given clothes for Xmas; this year I was pleased. Carrie bought me an iPod-thingy a few years back but I rarely use it. I spend all day listening to music so when I go out it’s a nice break just to walk around with my thoughts.